(Déjà vu all over!) One week later we find ourselves congratulating this side again. Our heartiest congratulations today to our CW U19 Girls, Provincial Champs. 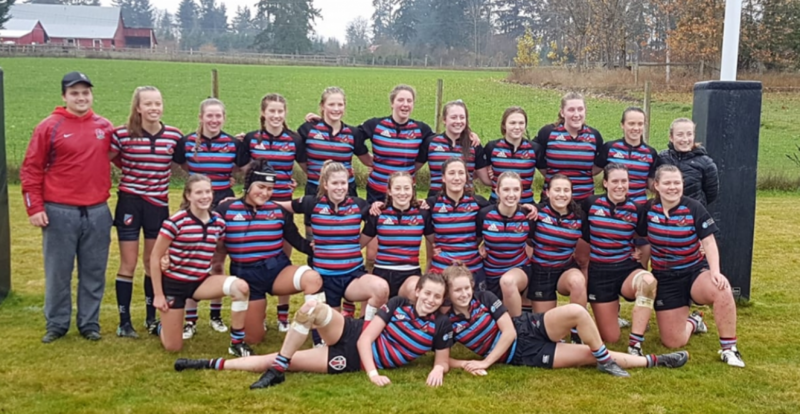 The girls defeated Abbotsford, 45 – 10 yesterday in Cowichan. We’ll try to pick up snippets during the week, suffice to say for now, well done coaches, Lauren and Ollie, managers, trainers and parents. Keep smiling ladies! Sunday afternoon also was witness at Windsor to two good games of VIRU Age Grade Finals. In the Boys U16 Final, James Bay showed a clean pair of heels in a big scoring differential victory over our lads, 60 – 17. This being said, it seemed far from such an outcome with long periods of play without scores and position being centered near midfield, albeit on CW’s side of center. Well done, James Bay – a good resurgence and return to age grade force. For CW, the boys could hold their heads high, bending but spirit not broken and actually completing the scoring with a well-taken try under the posts at the end of the game. This viewer gives CW’s Liam Poulton and Brad Robson a shout out, along with #2, #7 and a speedy #15. For JBAA, center, Spencer Lockwood stood out. Well done all CW players, with a ‘hats off’ to Mike Finnemore for stepping into the breach to coach this group when Kapi returned to UVic. Thanks for giving back, Finnie and finally, to all of the parents for your support - thank you. The U19’s took to the field at 2:30 and CW struck early and moved out to a comfortable 29 – 5 lead at the interval. This match was the antithesis of the precursor, with CW adding a further five tries after the break. Akin to the U16’s, even though the score line was a discrepancy of 60 – 5, James Bay did not give up and I note their M-o-M as being the #1 who gave a tireless performance. We will await a CW game report for further details. Not sure if the U16’s play a Provincial Final but we do know the U19’s do and we wish our Tricolors the best of luck. In conclusion , it was rewarding for the club to see a large contingent of boys end their age grade years successfully after starting rugby some nine or ten years ago as Mini players and better yet, to see their sheer enjoyment of the game. Thanks again to parents and those in attendance (including alumni players), to support the boys. We wish them well in next week’s B.C. Final. Finally to today’s officials, a very good job and to CW coaches (noted, James Pitblado giving back), Spenny and Rogie and the trainers, - ‘onyas! Now, today’s game reports now go back to Saturday when the Men Divvies travelled to Cowichan for Times Cup action and The Isles faced Westshore. Our match comments come to us, words of The Sage. Hard Hat (Players Award), Riley Ilnicki; M-o-M Gareth Sandner, (backs, #10) and Quinn Horton, (forwards, #4). I think the CW lads would agree, Christmas came early in Cowichan at Piggy Park on Saturday. This was a down to the wire battle between two even teams. Usually it is the visitor that comes up on the short end in such close, ‘away’ games, so it was with a deal of relief that the CW lads heard the final whistle. The fans (a good contingent of Premier Men/Women supporters traveled to Herd Road to cheer the lads to victory), also were heard to let out a sigh of relief! CW dominated at the scrums which is usually NOT the case vs the Cowichan and it took an outstanding effort all day by the Cowichan #8 kept them in the game in this phase, even when being shunted toward their goal line. So too at the Cowichan line out where their good work gave CW a handful of issues. The occasional stolen ball by CW jumpers did make this phase of play exciting. An early penalty kick by the home side that went off the post directly back into the hands of a smart, hard working Cowichan forward gave the visitors a heart attack! However it was to bring about a period of defence that was truly impressive. Eventually a penalty allowed a strong clearance kick by Sandner. There was plenty of good play and hard work to follow by all members of the squad for eighty minutes. Of note, this game saw the resurgence of Mike Crawford at #2. With ball in hand Mike was a force, showing improved fitness, matching the improvement of fellow forward, Quinn Horton, often taking attempted tacklers with him and on one occasion, showing a recently acquired skill with a Sonny Bill “out-the-back”, not bad for a converted footballer and forward to boot! In the backs, Oli Winser was full value with two nice tries to keep the score board ticking over. The men off the bench influenced the pace and force of the game and helping in a very big way to secure victory for all. Post-match. To repeat what has been said for many years by many teams from many places; Cowichan Rugby Club never disappoints and the respect for the opposition, the ref and the game in general, is always on full display. The pitch was in great nick, the Clubhouse was full on and speeches the best. Thanks to all at CRFC. Have a great Christmas and New Year and to our Ceedub boys, good luck in 2019, may many victories await you.” (Our thanks to The Sage and a merry Christmas to you too). Whilst this was going on, a full contingent of Islanders came up against a loaded and primed Westshore opponent. The Don notes to The Chaps after a 7 – 22 score line; “Boys - a solid finish to the first half, thanks to everyone who played and supported Islanders this season (so far)! Much to build on, starting with a solid group of guys. Touch will continue Thursday’s for whoever is available, keep fit one way or the other and start looking out for game updates in early January. We need a few more guys so recruit a buddy or two over the holidays. Especially front row -our boys need some subs! Well done today!” (Ed. The increase in numbers is a good thing, go Ceedub). The final word - good effort for NSMT 7's in Dubai - faded Vs France to end up eleventh. On to CapeTown, bigger and better things. Go, Canada!